The exterior sheathing system on a home can significantly impact energy efficiency, comfort and all around quality and durability. The "Green" Zip system is a one of a kind structural system with a built-in energy efficient barrier that keeps the elements out while keeping comfort and savings in. Moline Builders introduced the Zip System to the Toledo area and became the first Toledo area builder to use it exclusively ... making all Moline Builders homes "Green", when framed. Click HERE to learn how the Zip System and Moline Builders construction benefits the home owner. The Zip System is an engineered wood product, created for superior quality and durability. Moline Builders uses the Zip system so that you can rest assured that your home is solidly built with the strongest wall system available. 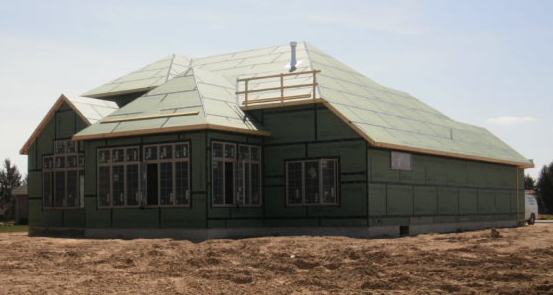 During construction, a home is exposed to the elements. But, Zip system sheathing has a water resistive barrier built into the panel, which protects the walls from water. In fact, the panels have a 180 day exposure guarantee and there's absolutely no need for house wrap, which moisture can intrude. If a home's walls are not well sealed, it could cost you a lot of money on your energy bills. The Zip system reduces air leakage, protecting the R-Value of your insulation. House wrap simply can't compete. The Zip System wall sheathing is backed by a best-in-class 30 Year Limited Warranty.